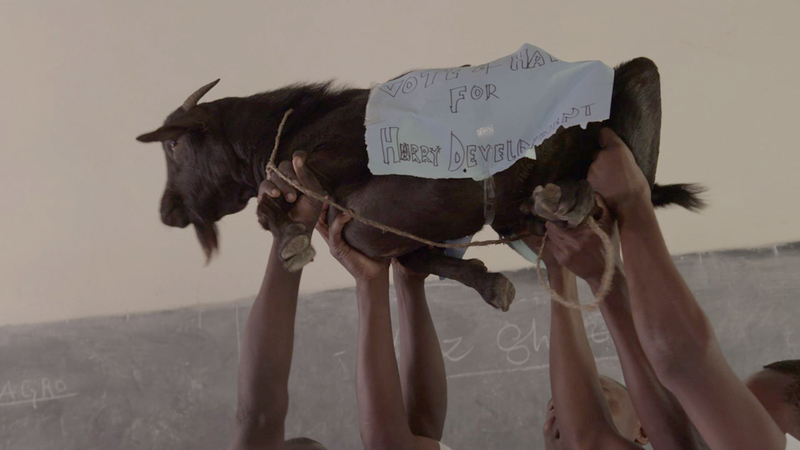 A Goat for a Vote follows three students in Kenya competing to become the next school president. Winning the election will not only earn them power and respect, but guarantees a role within Kenyan society in the future. Magdalene has to prove herself in a boy-dominated school which has never been led by a girl. She has the impossible task to unite all girls in her fight for equal rights. Harry, from the poor side of town, hopes to win so he will be able to take care of his family in the future. He struggles against the popular Said, who is a natural born leader with a disarming smile. The endless enthusiasm and motivation of these three candidates guarentees that this will be a fierce election battle. Whilst making my previous film in Kenya, I worked with a translator who was also the head of a secondary school. When visiting the school I was shown around by the head prefect; a pupil at the school. He told me all about his role and how important it was; the respect that he received and how his future was now assured. He told me about his victory during the elections and the money he gathered in order to buy votes. I was surprised that a child should speak so openly about his bought election. It was an eye opener for me. In Kenya, corruption appears to be a survival mechanism, the only real way to get anything done. As if there is no other way. And because this is so interwoven throughout the society as a whole, children are picking up on it from a young age; be it consciously or subconsciously. They don’t know any better and copy their parents’ behavior. This applies to the prefect elections, a tradition that was conceived to show children how democracy works, yet in reality is an event where children learn how to apply corruption methods in order to fit into the system. I find the notion that in a desire for change, the younger generation has to break through old habits, a disastrously vicious circle. I think it’s important that this process of habituation and corruption in the younger Kenyan generation is uncovered. The head prefect elections are a perfect example. Children are being prepared for the adult world and because they are not yet fully aware of the dark side of corruption, they are more transparent in their tactics. It gives me the opportunity to show the simplicity of the habituation process. Is there scope for young people to think for themselves or do they mindlessly take everything from their parents? If there is scope for reflection, do they ask themselves whether they are doing the right thing? Or are they becoming entangled in a web where there is seemingly no way out? I wanted to tell the story of the school elections now, due to the added seriousness following the aftermath of the current events surrounding the elections. Where corruption with sweets still appears harmless, you view it differently when you know that’s how the future leaders of Kenya grow up.